Apple has quadrupled its quarterly profits, thanks to global sales of more than 6.5 million of its iPod music players over the past three months. Net profit in the fiscal fourth quarter ending 24 September rose to $430m (£246m), from $106m a year earlier. However, the company's shares tumbled more than 10% in after hours electronic trading in New York after sales figures fell short of market expectations. Although revenues rose 56% to $3.68bn, analysts had expected $3.74bn. It is the first time Apple has missed forecasts in close to three years. "Expectations for Apple's results were pretty high and they needed to beat estimates for us to see a boost in the stock," said Jim Fisher of Univest Wealth Management. Some analysts also had predicted higher iPod sales, and blamed problems surrounding the introduction of the new Nano player for the dip in sales. The stock- which has been trading at a premium to rivals - fell $5.82 to $45.77 in electronic trading. Earlier, it had closed at $51.59 on the Nasdaq stock exchange. Apple has three-quarters of the entire global digital music player market. 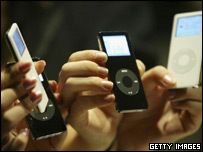 Sales of iPods were up 220% in the fourth quarter, compared with the same period a year earlier. During the fourth quarter Apple also sold 1.2 million of its Macintosh computers, a year-on-year rise of 48%. 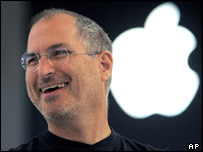 "We're thrilled to have concluded the best year in Apple's history," said Steve Jobs, Apple's chief executive. According to media speculation, Mr Jobs may on Wednesday launch yet another new version of the iPod, this time a model that can play videos.